yourname@Bertsch.org email forwarding available - write for details! 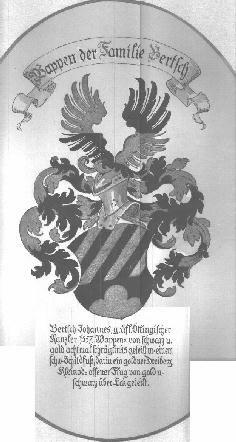 I can trace my Bertsch ancestors back to Michael Bertsch, born in 1625, in Benningen, Germany, which is near Stuttgart. He was mayor of that town, twice. I recently received a JPEG of the Bertsch seal from Germany. I've got a large version(109k) and a small version(23k). I was born in Saint Paul, Minnesota. My father Wayne Bertsch was also born in Saint Paul, in 1941. My grandfather, also named Edward Andrew Bertsch, was born in Bismarck, North Dakota, in 1904. Going backwards in time from Grandpa Ed, there's his father Andrew, born in South Russia in 1873, Andrew's father Christian, born in South Russia in 1850, and Christian's father David, born in Klein-Ingersheim, Germany, in 1808. The reference to South Russia above is a village named Johannestal, which is in the vicinity of Odessa in the Ukraine. Many germans came to this area to take advantage of the free farm land and other incentives offered originally by Katherine the Great. Successive monarchs of Russia made the deal worse and worse, and in the 1890's my ancestors left Russia, and came to South Dakota. German farmers who came to America via Russia are called German-Russians or Germans-from-Russia, and there is a web site called Odessa devoted to the study of these people. Maintained by Edward Bertsch of Technical Intelligence. Click here to email a comment.